The main piece of economic data this afternoon from North America has delivered a downbeat assessment of consumer spending in Canada and caused some selling in the Canadian dollar. Retail sales figures for November showed a larger than expected decline in month-on-month terms, coming in at -0.9% vs a median forecast of -0.6%. The prior reading was revised higher to +0.3% from +0.2% previously, but it still doesn’t fully offset the decline in the latest data. One area of particular interest is the level of total Cannabis sales, which came in at C$54M in November and reflects an additional component on consumer spending that was hitherto unrecorded in the data. Taking out car sales to arrive at a core reading doesn’t improve the outlook unfortunately, with the M/M core retail sales for November falling by 0.6% below an expected -0.4%. There was a revision to the prior reading here too, but unlike in the headline the alteration actually reflects even worse on the recent data. The prior reading now stands at -0.2% M/M, down from 0.0% previously and providing a bit of a buffer on the latest read. The comments on the trade situation are interesting but hardly groundbreaking with the remarks relating to the impact of Oil prices on Canadian growth and the bank’s data dependence are the most relevant for the Loonie. 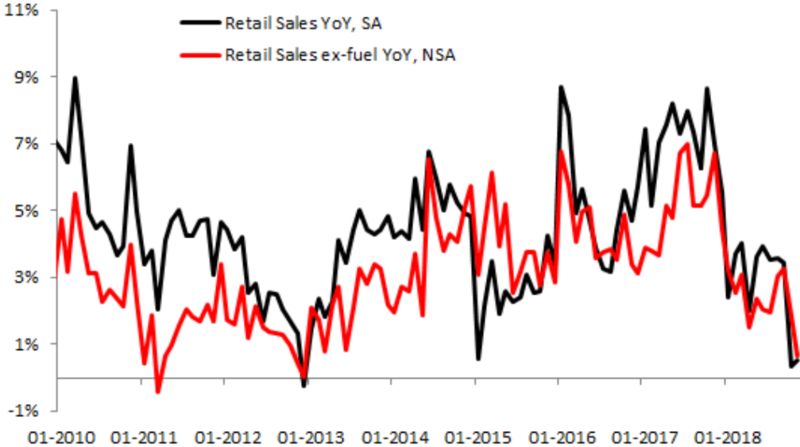 Given that Oil still remains relatively low even after the strong recent bounce and the soft retail sales figures it’s fairly safe to say there’s little here to suggest any more hikes anytime soon.